From Zero To Prius In Less Than Two Weeks! Two weeks ago I decided that owning two used cars didn’t make as much sense as passing down to #1 son a car that I knew was in good condition and had a long way to go and buying something new for myself. 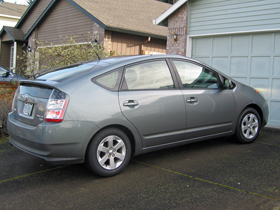 After looking at various options, I decided to look at the Toyota Prius, a mid-size hybrid sedan. Then I test drove one, and I was hooked. The waiting list, I was told, was between 3 and 10 months depending on how flexible I was willing to be regarding color and options. I was flexible as to color, but not options — I’ve always bought the lowest-priced of any car model and this time I wanted it fully loaded. I got on the waiting list at three different Toyota dealers (those that didn’t charge over MSRP — Ron Tonkin Toyota, Broadway Toyota and Royal Moore Toyota). I told them I wanted the highest option package only in Tideland Pearl, Salsa Red Pearl, Seaside Pearl or Driftwood Pearl, and prepared for a long, long wait. A week later I had an e-mail from from Pat Fitzpatrick at Ron Tonkin Toyota. There was a Tideland Pearl (my first color choice) with every option on the book being built in Japan, expected delivery in March, did I want it? U betcha! Last Friday I had a call from Pat. My car came in a little earlier than expected. I could pick it up at 5:00 PM. Wow! Good thing I had my financing already pre-approved via our credit union. 🙂 All I had to do was arrange for someone to come with me out to Tonkin to drive my other car home and I was set to go. And now I am a two-car, one-driver family, which seems really stupid. But #1 son will have his license in a few months. Until then I’ll have to force myself to drive the Outback every now and then, so it stays in good running order. Because #1 son is going to drive the Prius over my cold, dead body! Since coming home with it, I’ve been reading the manuals to figure out how everything works. So far I’ve taught the button on the rear-view mirror to open the garage door. And I’ve taught it to talk to my cell phone. I can now receive calls in the car by touching a button on the steering wheel. The caller’s voice comes over the stereo speakers and they hear my voice via the voice-activated-control mike. I’ve set my favorite radio stations (done via a touch-screen menu), and loaded a few CDs in the changer. I’ve taught it generally where “home” is (not exactly for security reasons), so I can chart a course to home from anywhere via the on-board navigation. I haven’t figured out the voice activation commands yet, but I know that if I tell it I’m hungry it will give me a list of restaurants.